Today I would receive my first glimpse of the ship. We’ve been doing a lot of home improvements over the last month, so we decided to make a trip to Ikea! Being lucky enough to only live around 45 minutes by car from Southampton, it really is simple to hop into the car and drive to the land of cruising memories. This was my first ever trip to Ikea and I had a feeling we’d be spending a little more money than we had first intended! As Ikea is open until 9pm on a Saturday, and as the sun was actually shining for once, we left a bit later in the day and decided to stop at Hythe Marina where we first saw the Royal Princess gleaming in the evening sunshine, quietly docked in Ocean Terminal, alongside her majesty, the Queen Mary 2. My initial impressions were good, she looked fantastic and well balanced, despite her bow being a little on the ‘stubby’ side. 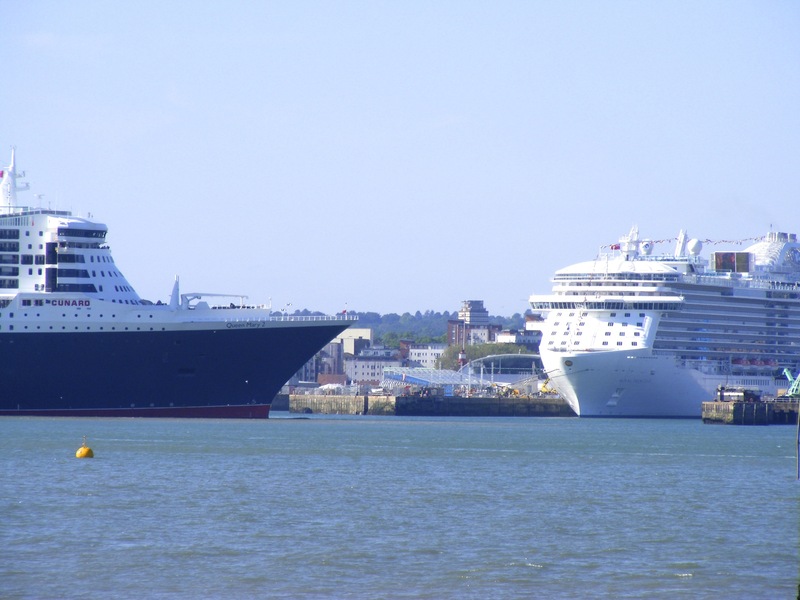 The docks of Southampton were extremely busy today, with P&O’s Ventura in, along with the MSC Opera, Celebrity Eclipse, and of course the QM2 and Royal Princess. 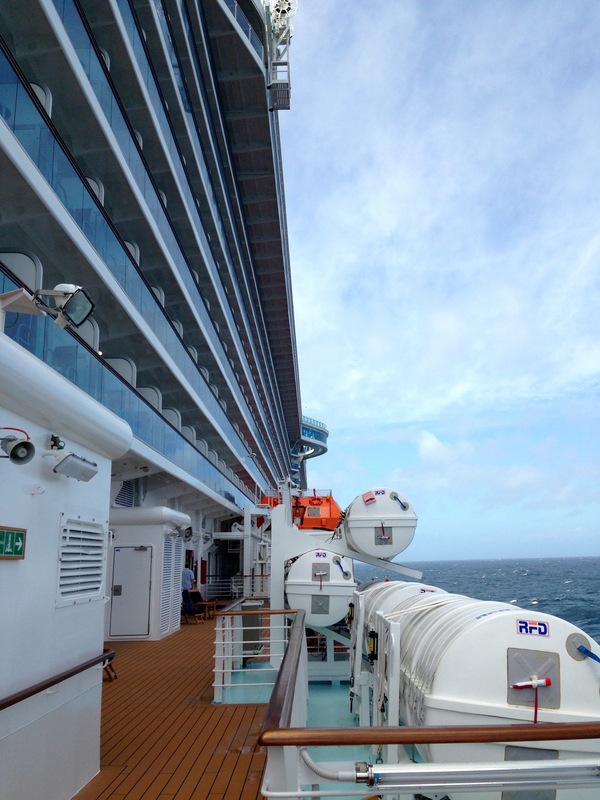 We stayed to watch them leave Royal Princess, bid farewell and sail into the sunset. Opera and Eclipse left with no acknowledgment to the new Princess, but horn battles were soon to commence in celebration as QM2 and Ventura department, both hailing the arrival of the new Princess ship, who replied in turn issuing her best rendition of the theme from The Love Boat – a trick which I could not believe until I heard it for my self. Once Ventura had left and the battles had ceased, we left for Ikea only to emerge three hours later to make our way home. As we drove over the by-pass out of Southampton, we saw her once more, gleaming in the dusk light, awaiting our arrival next week. Little did I know I’d be seeing her the next day when we had to make a second trip to Southampton – but that’s another story altogether! Tomorrow’s the day I finally get to step aboard and find out if she lives up to her reputation. But for today she has a slightly more important engagement – to be officially named by one of the current most famous royals in the world. The ceremony would start at 11.15am in Southampton’s Ocean Terminal, and be filled with all the pomp and ceremony that an event of this kind deserves. With performances from Natasha Bedingfield and the band of the Royal Marines, among overs, as well as the arrival and naming itself by the ships Godmother, HRH Catherine, The Duchess of Cambridge, it really was a ceremony fit for a Royal Princess. Unfortunately my invite never arrived (it obviously got lost in the post!) but I happened to be packing for the weekend when the naming ceremony took place, and so decided to take some time out to watch the live broadcast online. 45 minutes later and it was official, Royal Princess was now named and christened, all ready for me the following morning, when I’d be walking down that blue carpet for myself and stepping onboard for a weekend of total exploration, and of course, relaxation. 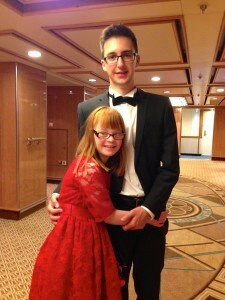 GoCruisewithJane was their in person and was treated to a celebrity Gala celebration onboard the evening before, so check out her updates and a vast array of photos from the events and her tour onboard over on her Facebook page Go Cruise with Jane. 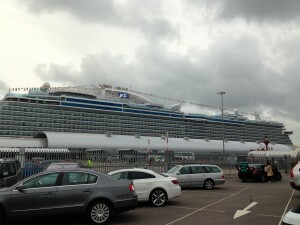 And so the day had come, I would finally get to step onboard the newly named Royal Princess – was it wrong that of all the new and exciting things to see and do onboard, all I could think about at this moment was sitting down in Alfredo’s to indulge in one of their famous pizzas?? 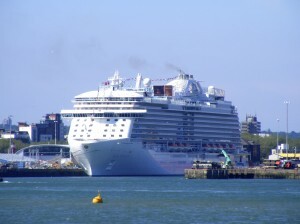 We were all up early and as we were packed and ready to go the night before, the idea was to leave home around 10am in order to arrive at Ocean Terminal around 11am, therefore maximising our time onboard. Well, as always seems to be the case for us, this didn’t happen and we ended up leaving for Southampton around 11.15am, more stressed than was necessary. However, by the time we reached Southampton this had somewhat dissipated, and as soon as Royal Princess came into view, any left over stress drained away and we all entered total relaxation mode. Seeing our ship come into view as we enter Southampton is a sight that never gets old, and truly marks the start of our next cruising adventure. Pulling up to Ocean Terminal about 12pm, we were directed to the baggage area where a porter unloaded our luggage and took it away to await us onboard, before Dad parked the car in the CPS parking area. The blue carpets were out along with the banners and flowers, making it really feel like a special occasion. A queue had begun to form as staff were only letting a number of passengers up the escalator at a time, informing us that everyone appears to have arrived at once – great, a long check in and wait before we can board. How wrong I was! The queue for the escalator was the longest wait, but we went from queue to ship in around 30 minutes. 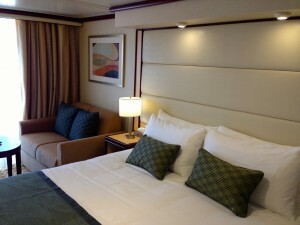 This would be our first voyage with Princess as Platinum members, and a perk of this level, which we were not initially aware of, was priority embarkation – so we were guided to the priority line, checked in, passed straight through security and on to the ship – wow, I could get use to this! 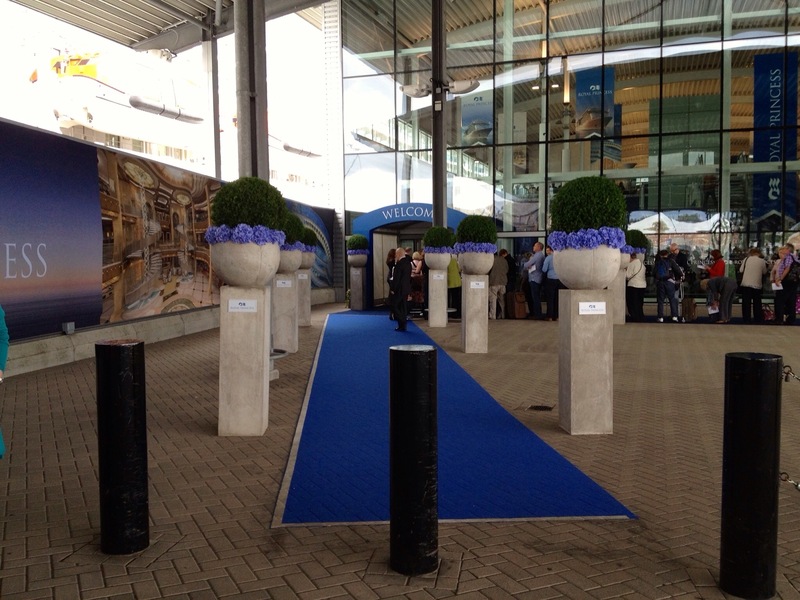 It was extremely well organised and this was aided by the addition of a new boarding stage between going through security and embarking the ship. I’m not sure whether this was just new to me, or a whole new process, but as seasoned cruisers will know you have to have a photo taken for your account and security procedures onboard. From my experience, P&O tend to do this at the check-in desk, and last year on Grand Princess it was taken as you cross the gangway and board the ship, often resulting in excessive cues when boarding. Well in this instance, there was a station between security and the gangway where 4 or 5 security staff were placed with handheld ‘camera computers’. Here they took your photo and then you entered the gangway and boarded. 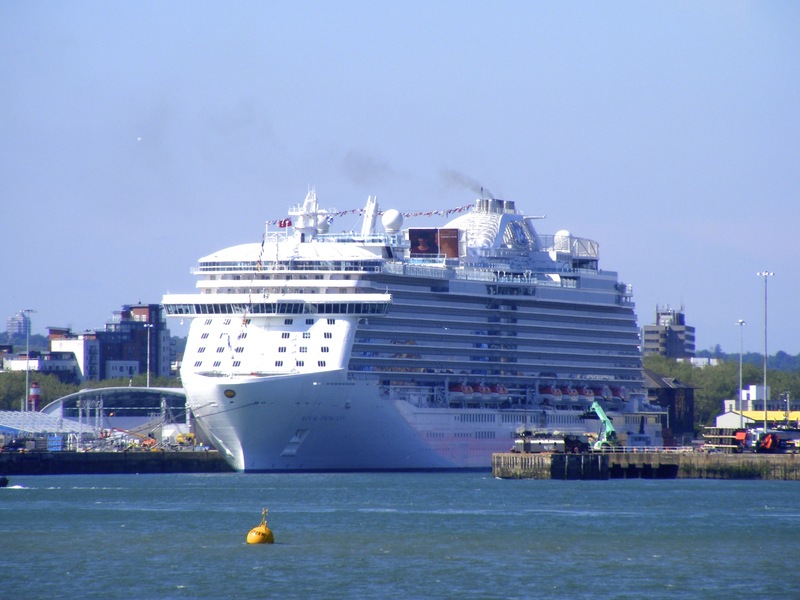 It was very effective and fast moving – a great addition to the boarding process, one which all cruise lines should adopt, it was so much easier. So, check-in, tick, security, tick, photos, tick, and all by 12.55pm. So far, so good. Now it was time to step onboard. We were greeted by some very friendly faces who informed us that the rooms were all ready, and so our first stop was our cabin – E522 – a new deluxe balcony room for four, obstructed view. 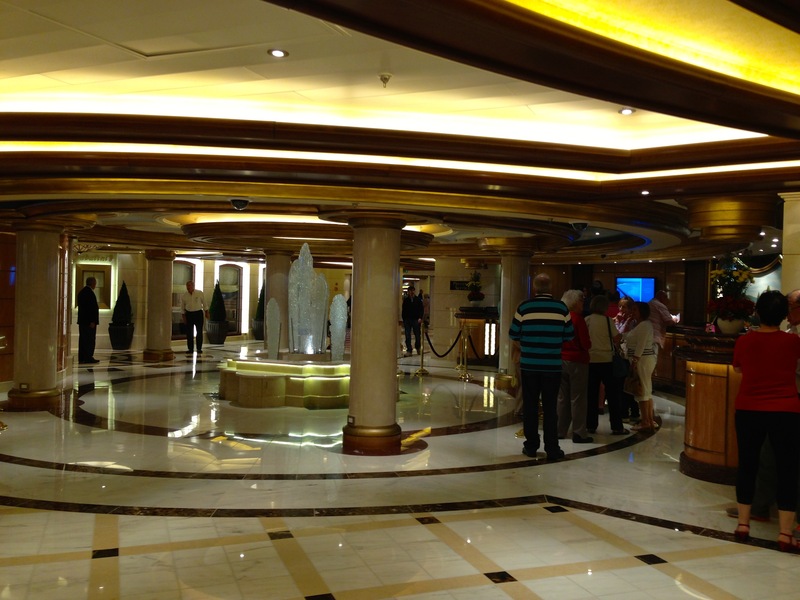 The first thing I noticed was the gentle and relaxing music being played in the hallways leading to the staterooms, a nice touch. 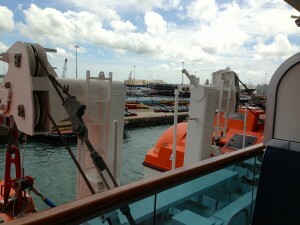 When we arrived our bags were already waiting for us, it seems this ship is run with super efficiency! The room was nice, looked comfortable and relaxing and had a fantastic tv, and plenty of wardrobe space, although draw space was limited. On the side was our Princess welcome back card, along with a hand written card from Jane to wish us Bon voyage – a nice surprise, thank you Jane! The bathroom (or should I say shower room?) was very small – in fact the smallest I’ve been in as far as I can remember. Bearing in mind that I am 6ft, there was just enough room for me to be able to change etc., so a little extra space would have been nice. However, we did go from one extreme to the other, having had a mini-suite on Oceana for Christmas, where the bathroom was about 4 times the size! 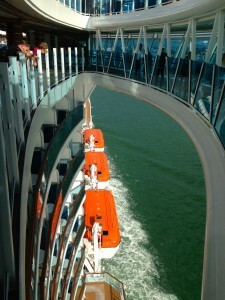 The balcony was also quite small (ok, very small for such a big ship!) and had just enough room for 2 chairs and a side table, and obstructed view really does mean obstructed…we had a the glorious view of a lifeboat, with a slight sea view above. We new this would be the case, and given the nature of this cruise it really wasn’t a problem. However, for us, it would be no good for a longer cruise as we enjoy our balcony a lot and the view and private space it provides. Maybe it’s due to being spoilt by the larger balconies on ships such as Azura, Ventura and previous Princess ships, but the balcony just wasn’t up to the mark. On the plus side however, it did mean that in the event of an emergency, we’d have priority boarding onto the lifeboats. 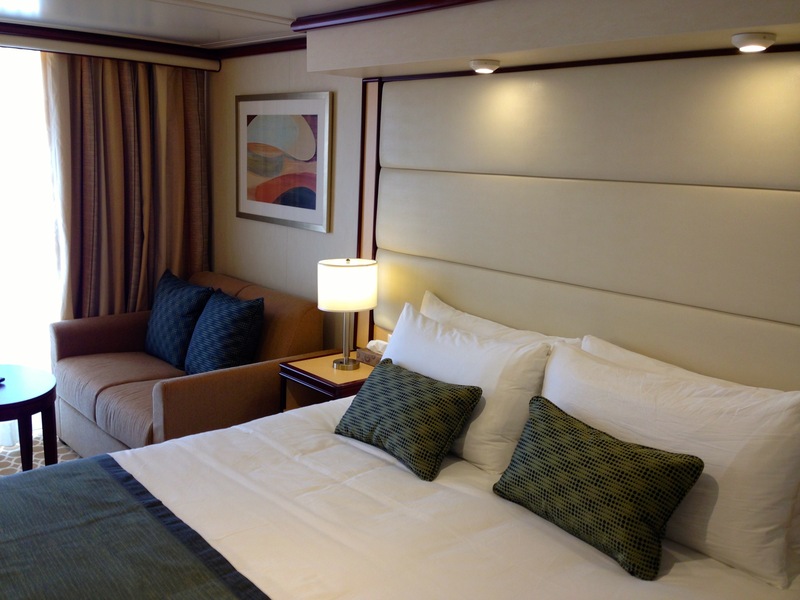 Anyway, overall the room looked comfortable, and certainly for our 2 nights onboard, it would serve us well. For now the new expanded Piazza was calling, and a certain restaurant known as Alfredo’s. As most passengers were still boarding it seemed like the perfect time to try out the new menu. When we were on the Grand Princess last year shortly after her major refit, Alfredo’s proved to be extremely popular and often involved waiting for a table, and so it seemed a great idea to try it out for lunch today, whilst it was still quite, and the perfect way to begin our royal experience. 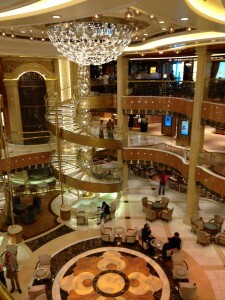 So into the lift and down to deck 7 and the Piazza – wow, wow and wow. The piazza was stunning and it was obvious that a lot of time and effort had been spent on designing this area. Initial impressions were fantastic and I could really see how this will become the social hub of the ship. On to Alfredo’s and it appears to be around three times the size of its predecessor! We were seated straight away on a table for 4, but warned that they were busy and there could be a wait time of 30-40 minutes for a pizza. Busy – the restaurant was less than half full. I don’t mind waiting for the pizza as I know it’s cooked fresh to order, but if this is busy, I dread to think how they will cope when the restaurant is full! We were seated and our drinks order was taken. On the Grand Princess there were water glasses on the table ready, like in the main restaurants, but here there were none, so along with the drinks we asked for water. Off the waiter went and moments later was back to take our order. 15 minutes later and still no drinks, but the arrival of a party of 12, seated on the table opposite. Within moments of being seated, glasses were on the table and water was poured, and yet we still had no drinks. Off to the manager my parents went whilst my sister and I waited at the table. Typically, they had only just left when a flood of waiters arrived with our drinks order, along with glasses and water jugs, and all of our food – talk about all or nothing! My parents came back and we all enjoyed a delicious pizza. The manager came over twice during our meal to ensure everything was ok. So overall our first eating experience wasn’t our best, but the food was great and in the end the wait time for the meal was not bad at all – for now we would just put down the poor service to initial teething problems, and hope we wouldn’t experience similar problems again. As the sun was shining, we took our initial venture up to deck 16 where we come across, in my opinion, the first major design floor of the ship. By now the lifts were extremely busy and so we decided to take the stairs. Ah, the midship staircase does not span across all the decks meaning in order to use the stairs to go up to 16 you have to first go forward or aft. To me this is a major step backwards, especially given the size of the ship – depending on the lifts midship is something which really frustrated me on the Grand Princess, and given that our room for this voyage was midship, it was even more annoying – I’m afraid that unless the ship is quiet, I am definitely a stairs person. A lift did eventually arrive and I went and parked up on a comfy sunbed overlooking the new water fountains on the top deck. The weather was beautiful and the fountains were being tested, so it felt like I was having my own personal fountain show. They are a spectacular feature, a lot more effective than I thought they would be. I stayed here and watched for a while whilst Mum, Dad and Beth went off to explore the top deck. There is plenty of deck space and sun loungers and again the space feels well designed and very relaxing. This area also houses Movies Under The Stars, a signature Princess feature, and for once I was impressed with it. 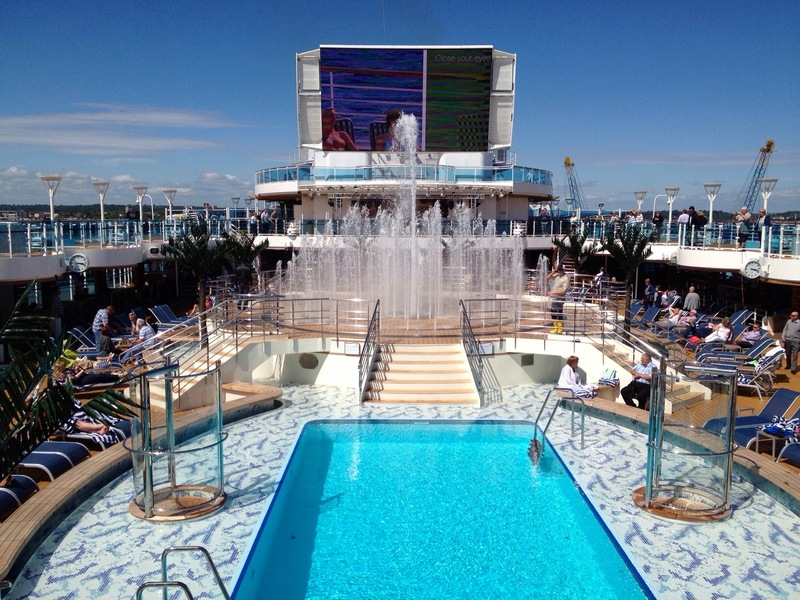 The sun was very bright and shining directly onto the screen, yet I could still clearly see what was being shown – an advertisement for the spaces onboard Royal Princess. Next I took a walk a long the highly anticipated Sea Walk, or at this moment, Concrete Walk as we were still currently docked! It’s weird, and felt extremely unnatural, but is a great viewing platform. Another aspect that I was unsure of, but in reality works really well. I was concerned that both the fountain and the Sea Walk would be mere gimmicks rather than impressive features, but initial impressions suggested otherwise. 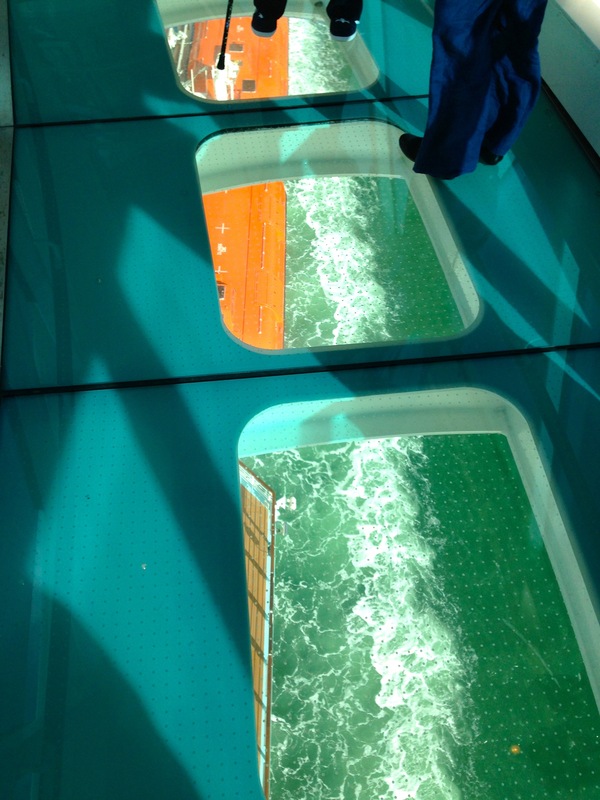 Next, the muster drill was looming and so it was back to the room to collect the life jackets and down to the Concerto dining room – Muster station F. Ahah, we found the midship stairs, problem is they were the staff only ones, opened up to us for the muster drill. We were directed down the stairs, but left unattended, where we could have easily disappeared on an adventure to explore ‘behind the scenes’, but as we are good passengers we didn’t, although it took some effort to stop Dad being nosey! The muster drill was well organised, with plenty of space and seating. The dining room was classy and relaxing and started me thinking about the forthcoming meal that night. Back to the room and then Mum opted to sailaway on the balcony with Beth, whilst Dad and I went up to Horizon Terrace to watch Southampton fade away into the distance, whilst listening to a couple of the ships renditions of the Love Boat theme. Horizon Terrace was a very relaxing area and on this occasion not particularly busy, but it did feel quite small and I fear that this should have been much bigger with more seating, as it’s bound to be a popular destination when cruising the Med. One thing to note with regard to the staterooms and suites directly below the Horizon Terrace is that they are completely overlooked by fellow passengers relaxing on the terrace, and as this will inevitably be a busy area, for some it may spoil their balcony use. 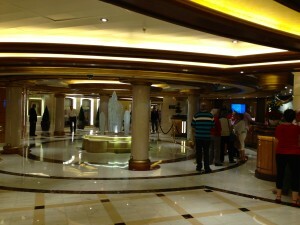 This evening was a celebratory gala night, with Captains welcome reception and champagne waterfall. All suited and booted and back down to the Piazza, we went for a stroll around the festivities. Complimentary champagne was flowing and surprisingly the ship felt very empty, not in a bad way, but normally these events can be so packed you can hardly move. Knowing that the inside rooms had not been sold for this voyage, I was convinced that the ship couldn’t have been much more than half full, but later was informed that there were actually approx. 2900 passengers onboard out of a possible 3600, so well over half. Again, hats off to the designers as they appear to have got the space to passenger ratio spot on. The atmosphere was great and the new piazza looked even more stunning. The shops were well laid out and every aspect of the passenger spaces, from each of the bars and lounges, through to the internet café, seemed elegant, sophisticated and comfortable, giving off a ‘no expense spared’ feel, which was excellent. On to the 8.15pm production in the new Princess Theatre – apparently it would be the premier performance of a new show by the ships resident singers and dancers, entitled ‘Colours of the World’. The theatre was comfortable, and the new lighting system was very effective, bringing you into the performance. The show was good, but to be honest I was expecting more. Two of the singers were excellent, one OK, and one left a little to be desired. The video wall and props were also effective, adding an extra dynamic, but the show did feel underwhelming for such a ship as this, and after experiencing their highly regarded show that is ‘British Invasion’ last year on Grand Princess, I hoped for a bit more on the entertainment side in the theatre. On the way to dinner, the Piazza entertainment was in full swing with a fantastic gymnast/stunt act taking place, which involved 3 guys acting out a cop vs. mafia type situation. They were brilliant and extremely talented. On to dinner, which was very organised and delicious. For the first time we had Anytime Dining as we felt the flexibility may work better with my sister. We ate in the Concerto dining room and were greeted by four very friendly faces who all proceeded to seat us at our table and wish us a good meal. Something was telling me they were slightly bored! Service was excellent and very efficient and I couldn’t have asked for a better, or more relaxing dining experience on our first evening onboard – it certainly was first class. Unfortunately, time had run away and we missed the first ‘official’ fountain display, but they would be doing another tomorrow night which I hoped to see. Before retiring we took an evening stroll around the Fountain deck again, and across the Sea Walk (which was not lit up as advertised). The Great and Powerful OZ was playing on MUTS and again, the picture and sound quality was the best I’d witness on a sea screen like this. This pretty much marked the end of my first day onboard and I don’t know whether it was the ships doing, but I felt as if I’d already been onboard for a week, in total relaxation mode – A first for me! There was still so much more to see – the Pastry Shop springs to mind! – but these things would have to wait until tomorrow. Back to the room, which had been turned down ready for the night. We had received a notification prior to boarding that when either the 3rd or 4th bed was in use, the balcony door access would be restricted. This did not bother us, again due to the fact we were only on for 2 nights and would be spending little time in the room. But I thought that it would not be so bad, just a bit awkward to get through, but no, it really was restricted, and impossible to access the balcony door. This seems like another design issue, and on a longer holiday I’m afraid we wouldn’t be able to put up with it. As well as this, the sofa bed blocked access to the fridge, making it impossible to get our drinks out. A further flaw that surfaced was with the lighting. With the main lights it was literally all or nothing – there was no separate light for the wardrobe area, meaning if someone was sleeping, such as my sister, and you want to see in the wardrobe, you have to turn the main lights on everywhere, flooding the beds with light, disturbing those who are sleeping. A minor issue really, but something that I feel really should have been thought about. It would appear that if there is an area that did not have as much effort put into the design, it is the rooms. When unpacking and actually ‘using’ the room, the furniture and furnishings felt inadequate compared to the rest of the ship and I do question how long lasting they will be, given that the quality of the materials didn’t seem great e.g. draws feeling flimsy. The Samsung 32inch LED TV was stunning, but the ‘interactive’ TV programming was appalling. There was a nice selection of films, but channels were limited, there was so access for your onboard account, making reservations, viewing menus, or photos etc. etc. and the location map and weather was wrong, having us off of the Isle of White for almost the entire voyage. Perhaps these are further teething problems which will be rectified, but compared to the new interactive systems on ships such as Azura or Celebrity Eclipse, Royal Princess falls flat. However, for our weekend onboard the room and amenities would suffice. Morning arrived after a rather hard sleep – the mattresses were all quite uncomfortable and too firm for our liking. Breakfast arrived right on queue and for the first time ever they actually had our order right, even down to enough milk for tea and cereals for everyone, very impressive. Today we were suppose to be anchoring off of St Peter’s Port and tendering in, however the Captain deemed the sea was too rough for comfortable transportation and so the port of call was cancelled. Something tells me this was pre-planned, or at least largely expected as within an hour a new Princess Patter arrived, declaring today as a sea day, with all the extra activities and entertainment which this entails. And so after getting ready, in which another niggle presented itself when the shower temperature refused to stay constant, and the pressure wasn’t exactly fantastic. We left the room for a stroll around and Mum decided to have a look in the Spa, now situated on deck 5 next to customer relations, and book herself in for a treatment that afternoon. Little did we know that despite this originally being a port day, the sudden change to staying at sea meant sea day prices were now enforced, Mum was not impressed. From the Spa, and into the Piazza, where yet more entertainment was being provided, this time by a young woman and her hula-hoops. She was talented, and I certainly could never have done it, but compared to the gymnasts the evening before, I’m afraid she wasn’t quite as entertaining, especially as a few of her tricks didn’t go to plan. On our travels, we visited the casino and Club 6, Vines wine bar, Gelato’s ice cream parlour, as well as the Princess Live studio and café, passing the Wheelhouse bar and Crown grill before stopping at the Vista Lounge where an art auction was being held. Taking a peek into all of these areas, they each seemed to have the same level of comfort, elegance and design, and again it was clear that the public spaces had been given a lot of time and effort to ensure they worked well. Princess Live is an interesting concept, one that on this occasion we didn’t have time to try, but in my opinion it will be a feature that people will either love or hate, probably ultimately decided by whether you like audience participation. The Vista lounge had a great atmosphere and was a nice area to sit and relax with a drink. 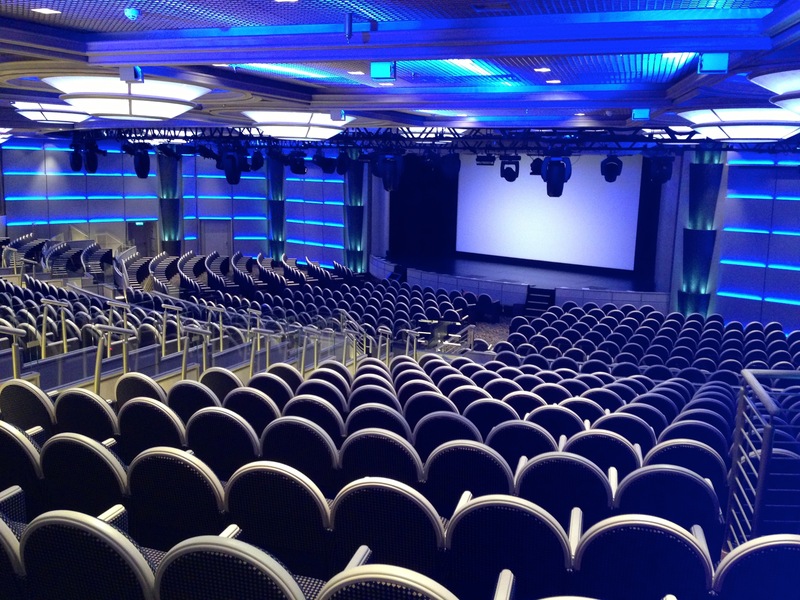 For P&O fans, I would describe Vista as a cross between Starlights on Oceana and Manhattan on Azura, culminating in a contemporary show lounge/club. Next up was a visit to Horizon Court and Bistro for lunch. This area deserved yet another wow – and it was a big one. You may have guessed that I like my food, and this area did not disappoint! 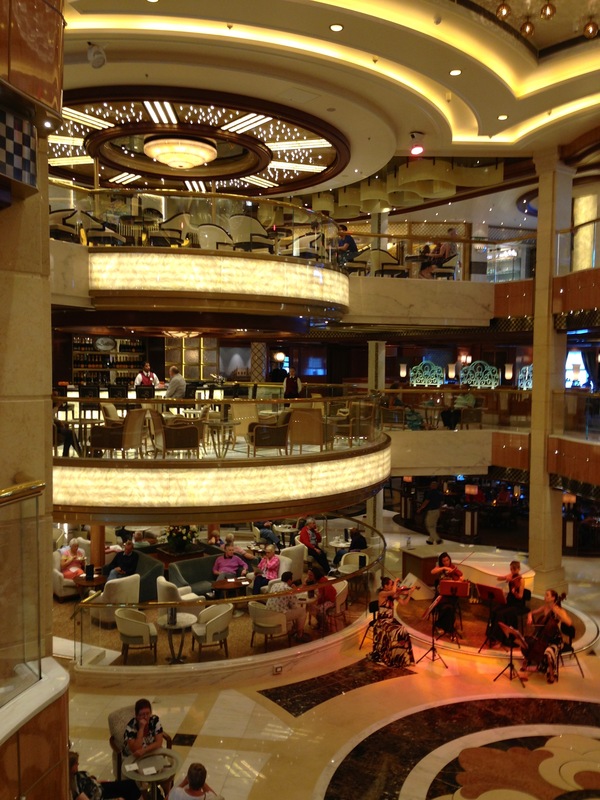 I have yet to come across a buffet restaurant that beats the layout and choice provided by the Windjammer Café onboard Independence of the Seas, my very first cruising experience, with no buffet coming close since. 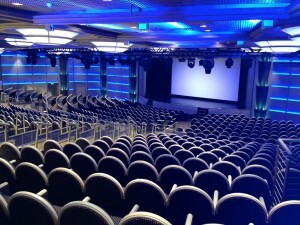 However, the new Horizon Court definitely meets this standard, and dare I say it, may even exceed it! The layout was clear and spacious, reducing cues and providing ease of access to a huge choice of food. The seating mirrored this with subtle, elegant colour schemes providing an extremely relaxing area to eat in. Unlike previous ships, the tables are ready laid with cutlery and cups etc. for breakfast, lunch and dinner, and waiters serve your drinks for you. This was an excellent edition and removed the rush around the drinks areas, but when we were there it was not particular busy, and I do wonder how well this system will fare in rush hour. Finishing our lunch, we moved from Horizon Court down to Horizon Bistro to try out the Pastry Shop. As the name suggests, this area is decorated to resemble an outside bistro, with tall tables and chairs. Inside the pastry shop there was a huge array of cakes and pastries, as well as several chefs serving hot dishes and a chocolate fountain selection. Suffice to say we all over indulged and I couldn’t speak more highly of the newest addition to Princess’ buffet. A quick trip back to the room and then down for a leisurely stroll of the promenade deck. Here we were confronted with another design issue with the ship – one that was a major drawback for my Dad. 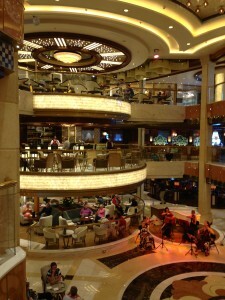 There is no promenade deck in the traditional sense, i.e. where one can take a walk around the circumference of the ship, rather ‘promenade pockets’ that were restricted from each other by crew only stations and lifeboat equipment. This was a major disappointment and one I’m sure a lot of others will feel similarly about. In my opinion, the promenade deck is a traditional aspect of a cruise ship that should not be tampered with, and so for this I am afraid Princess gets a thumbs down. There were also certain outside areas of this deck easily accessed from within, but were actually crew only areas. This was not clearly marked and on one occasion I went for a walk and found myself here having missed any signs to warn me that it was a no go area. Anyway, we managed to find a secluded spot in the sunshine, overlooking the ships wake. 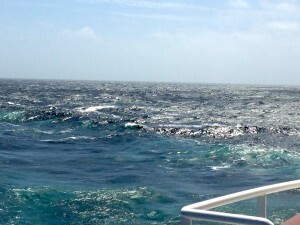 The waves were rolling a bit now, and I think the Captain definitely made the right choice in cancelling today’s port of call. Next a trip to the international cafe was in order – the sea air had made us thirsty. A beautiful selection of pastries and cakes awaited us, with a couple of afternoon cocktails, overlooking the piazza where a string quartet was playing. I have to say that the entertainment in the Piazza was excellent. There was always something happening, from traditional pianists to more contemporary, unconventional acts such as the acrobatics – there was always something to entertain you. Whilst in the piazza there was one aspect that I had yet to see, which was a must – the dueling glass pianos in Crooners Bar. Unfortunately, they were nowhere to be seen. Where they should have been, there was a standard grand piano, which had been creatively decorated. It was a beautiful piece, but this was one of the things I was most interested in with respect to the new entertainment onboard, and so I was somewhat disappointment. Whilst in the Piazza, I used the opportunity to take a peek at the new Bellini’s Bar and Ocean Terrace seafood bar. 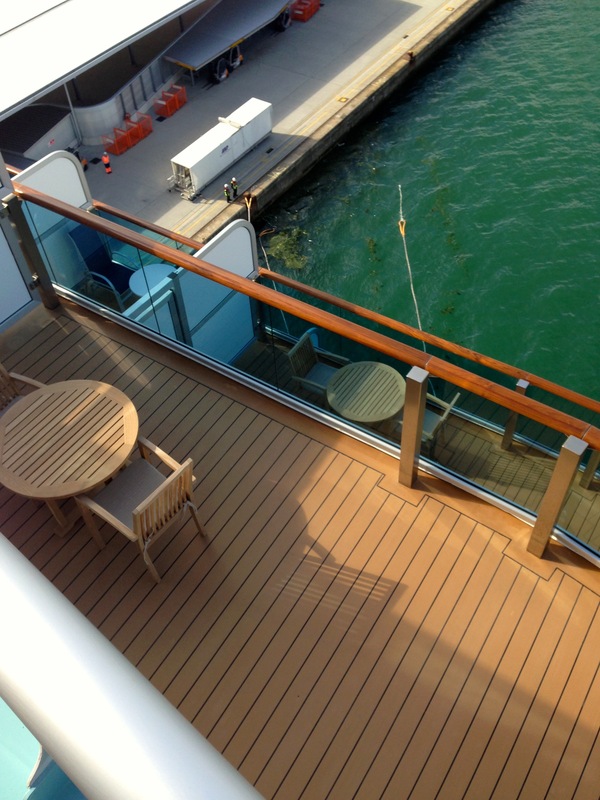 Although we did not actually use these, again they were very welcoming and both had stunning views of the atrium, being situated on deck 6 & 7 of the piazza. Back to the room for a bit of R&R and to get ready for the evening, whist Mum went down to the Spa for her massage. The new customer relations and shore excursions ‘annex’ off the piazza is a great idea, with plenty of space, but having the spa situated here right next to Sabatini’s specialty restaurant does seem a little unconventional. But still, I can see the logic of putting the spa on the lower decks, with easier access whist also freeing up top deck space for sun loungers and outside areas etc. Anyway, 1 hour 15 later and extremely loud music started vibrating up through the floor of the stateroom, and was still going when we left the room half an hour later. According to the deck plans, Princess Live was right below us, and so I can only conclude that this is where the music was coming from – something to bear in mind when choosing your room onboard! Luckily for us it did not occur again. Whilst in the room, I decided to try out the new, free to access, online Princess Patter on my iPad as I had heard all about it in Princess’ latest advertisement. I thought that it may make up for the lack of interactive TV – I was wrong. The WiFi signal was not strong or constant enough to enable my iPad to connect, meaning I couldn’t access it. However, later I tried again on the Horizon Terrace, where the signal was excellent, and it all worked perfectly fine. This new tool gives instant access to your onboard account, as well as information on the days events and activities, latest information and areas on the ship. It is a great addition to the online network and was very efficient, when you can connect to the WiFi signal – which I never achieved in the cabin. Meeting back up with Mum, she informed me that service in the spa was excellent, the massage/treatment was outstanding and it was a very relaxing environment. She said the only, and some would say major, issue that occurred was the continual occurrence of very loud music from above. 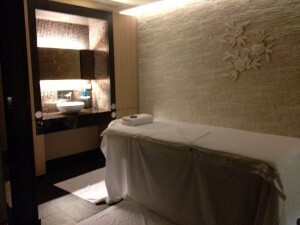 The therapist was clearly not impressed and it was obviously a topic among the spa department. Apparently the spa is directly below the theatre, hence when rehearsals are taking place in the day, the music can be heard, turning a relaxing environment into the complete opposite. Again, luckily for Mum this only occurred within the first half an hour, but I should imagine that this will cause more than a few unhappy customers! Dinner this evening was delicious once again and perfectly prepared. However, service was the complete opposite to the evening before in that it was extremely slow, even though it wasn’t particularly busy. Whereas the evening before had been ultra efficient, almost edging to the brink of rushing, tonight it seemed as though we were waiting ages between courses, ages for drinks, and ages in general. 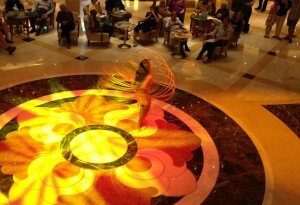 In fact, dinner took so long that we missed the dancing Fountain show once again, which took place at 9.45pm. 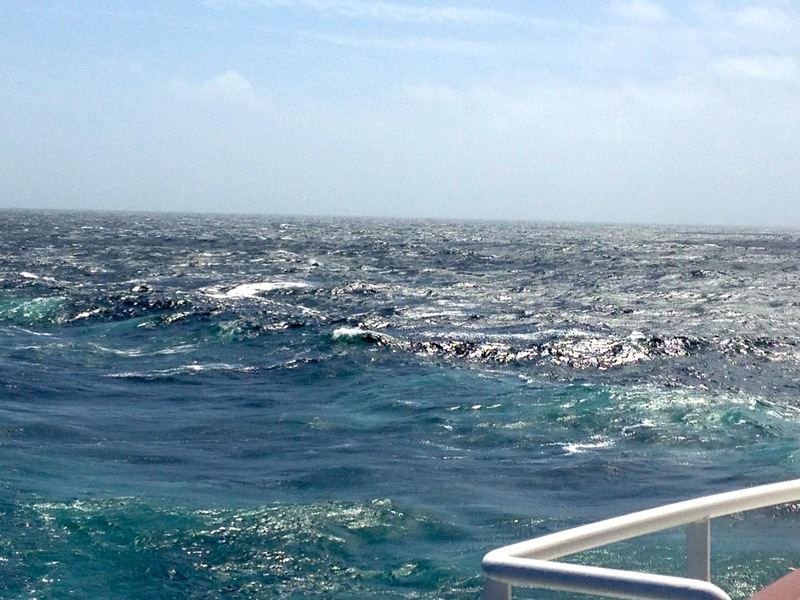 Obviously we were not meant to see the fountain show on this voyage – maybe next time (hopefully!). Despite the service being slow, our waiter was very friendly and served us well – I feel the timing issues were beyond his control. A further note to mention about dining in general is how there does not seem to be anywhere to view the days menus i.e. the evening dinner menu that traditionally is located outside the restaurant for guests to contemplate over. This is by no means a major issue, but it is nice to be able to view dinner options before sitting down to eat. This appeared to be the same for the Horizon and specialty restaurants also. Disembarkation morning occurred all to quickly and it was very well organised meaning we were off the new Royal Princess in double quick time, waving her off into the distance. Disembarkation information and groupings had been issued at embarkation, something that obviously helped with organsiation, but left you thinking of the end of your holiday before it had really begun. So we were group 8, to meet in Princess Live to disembark at 8.45am. However, another perk that comes with Platinum status is the use of a more comfortable disembarkation lounge, in this case the Vista Lounge, and so we would be going here until the time arrived to finally say goodbye. We were all up early and ready to go, so decided to go up to Horizon Court to have one last breakfast out on the Terrace before we left. This may have been a bad decision… I am not sure if it was the same within the Court and Bistro, but out on the Terrace the service was appalling. Everything was too much effort for all the waiters, there were no smiles, and nobody served the tea or drinks, despite the tables being laid for this to take place. It was a very bad experience and one that jaded the end of our preview cruise onboard. In fact, I think it was some of the worst service we’ve ever received onboard, and the attitude of, and atmosphere created by the crew in this area was definitely the worst. You felt unwanted and an inconvenience. Whilst eating our breakfast, a waiter went over to speak to a lady on the table opposite us, who was smoking a cigarette, informing her that she was not allowed to smoke there, indicating that it was only one corner of this area where smoking is permitted, outlining the designated area. Her response to this was that she’s been smoking in this area all weekend and nobody has highlighted this to her. The waited did not respond to this and only stated that she may finish the one cigarette but must go into the ‘right’ area if she would like another. OK, so she was supposedly smoking in a ‘non-smoking’ area. However, this lady was less than 3 feet outside of the area he outlined, there were no signs to indicate that smoking was not allowed past a certain point, only this barrier which to the untrained eye was completely invisible. Now, I do not smoke, and I am aware that this is often a huge topic of debate among the cruising community, but I would say that this is extreme and unfair. I personally don’t like to be inhaling someone else’s second hand smoke, but I have the choice to go and sit anywhere on the ship. This is something that had not been drawn to my attention onboard until now, but smoking spaces were very limited on this ship, and where smoking was permitted, it was not clearly marked, apparently being cordoned off with invisible barriers that people are forbidden to step over. The policies on ships such as Azura seem to work well, where half the area on the stern is smoking and the other half is not, with equal access to all amenities, chairs and loungers – On royal princess there was nothing relaxing about the smoking area on the Horizon Terrace – something I felt was a little unfair. 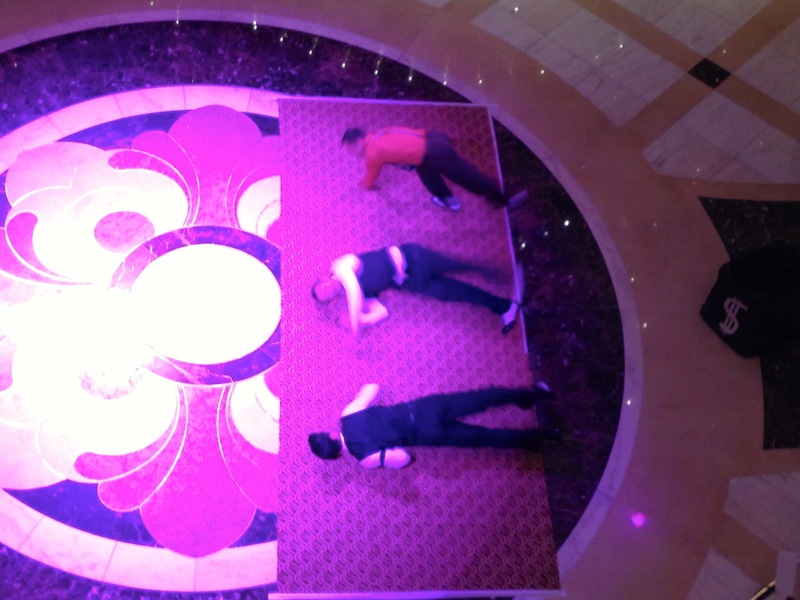 So overall, our last experience on Royal Princess was a miserable one, which was a real shame, but we would not let it spoil the other great experiences that we have had onboard. From breakfast we went down to the Vista lounge where we were informed at the doors that they we so organised we could disembark straight away. 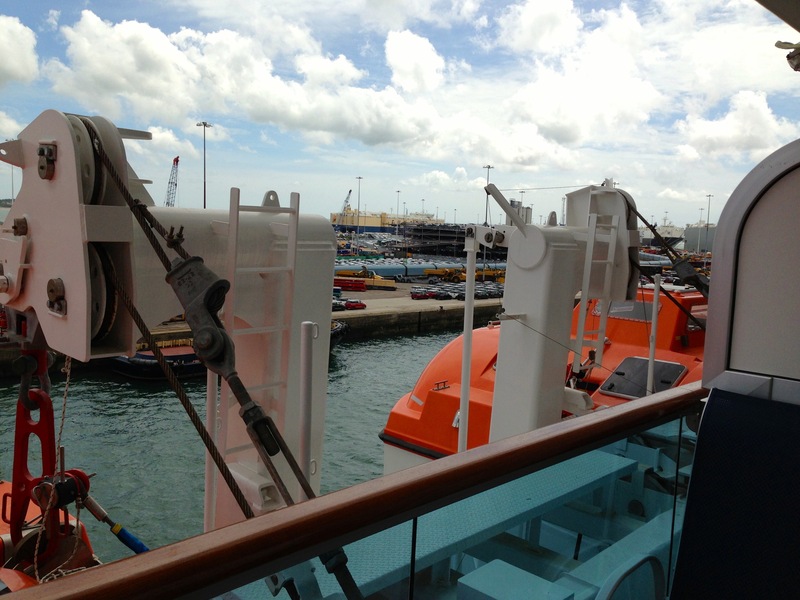 So off to the Piazza, deck 5, with lots of goodbyes along the way, across the gangway and back to the car. 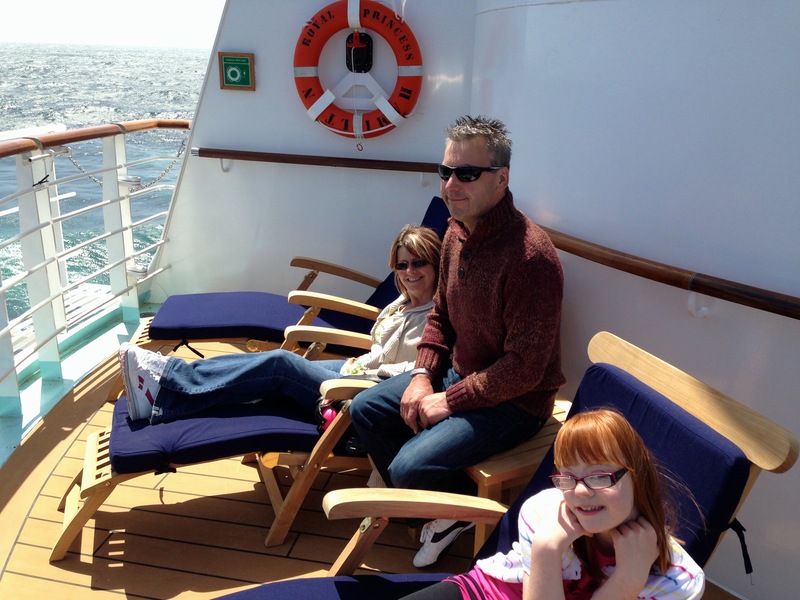 The end of our royal voyage had come, we disembarked into a cloudy Southampton and in 45 minutes we would be home facing the post-cruise blues. 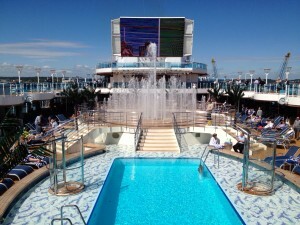 To sum up – Royal Princess is a beautiful, elegant and extremely relaxing ship, which is both innovative and stunning. However, as highlighted, she definitely does have design flaws, with some being more serious than others, each of which will be viewed different between passengers depending on personal preferences. For me, the major issues were no promenade deck in the traditional sense, no midship staircase spanning all decks, and the lack of planning in the new deluxe balcony rooms. When so much effort and money has been spent on making the public areas as perfect as possible, it is a shame that a little more thought was not afforded to the cabins. 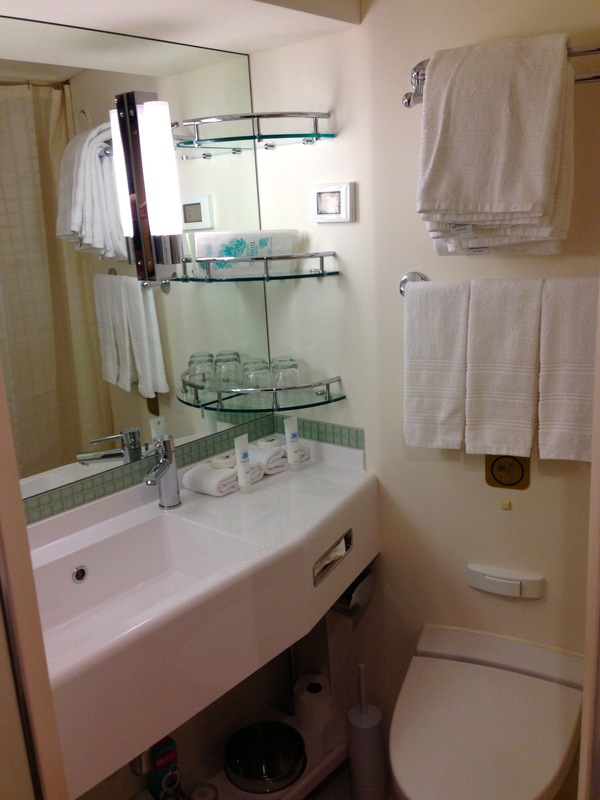 Such tiny balconies and bathrooms should start becoming a thing of the past on these new super liners, and little things like beds blocking doors, lighting troubles, and poor quality furniture all combine to make a room that is not fit for a princess. The deluxe balcony may be deluxe for a couple, and at a push, for three, but on a voyage any longer than 2 nights, I feel it is impractical for four and you may as well save money and go for an inside room, because you certainly won’t be able to access the balcony at night or first thing in the morning. However, there also seems to be location issues with rooms above and below areas such as Princess Live and the theatre, and the noise disruptions this brings. Perhaps this is something Princess may look at, as they may easily be able to aid this with further soundproofing etc. Also, service levels and the attitude of the crew is something that seems to be at polar opposites onboard, being either fantastic, or appalling – Princess needs to correct this desperately. Service must remain at an excellent level, and our experience in the Horizon on disembarkation day was far from this. 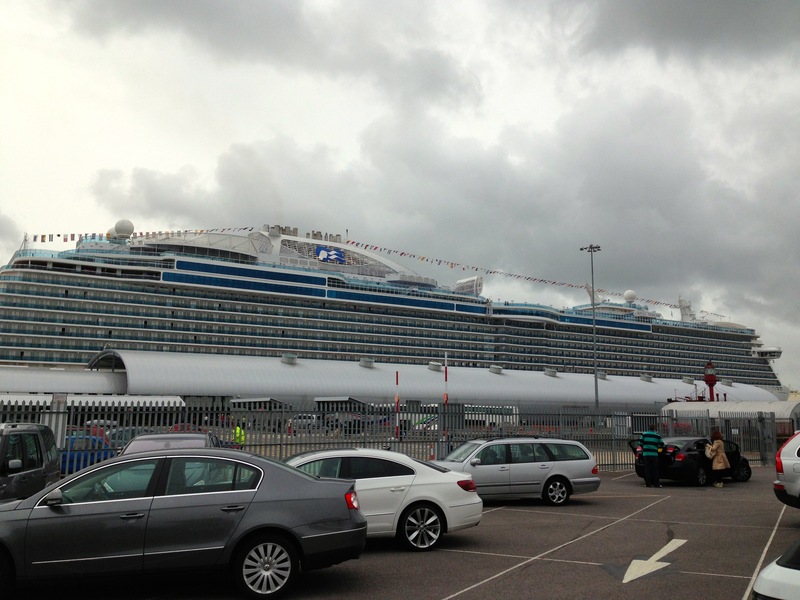 Despite these issues though, Royal Princess is truly a magnificent ship, and all of us agreed that we would like to sail on her again, once the teething issues have been ironed out! We didn’t get to use over half of the facilities and some areas we didn’t even see (the sanctuary, fitness suite, children’s areas), so it’s safe to say there is certainly enough to do onboard and longer than two nights is needed to be able to experience the ship fully. She certainly provides a relaxed experience with a wealth of activities to do. Standout features definitely include the new expanded Piazza, the Sea Walk, the Horizon Court/Bistro and, of course, the Pastry shop, but also the overall layout of the ship. She is easy to navigate around (within one day I new my way around), partly helped by the fact she truly is an evolution of the traditional Princess experience. If Princess can sort out the service issues at least, then I’m sure she will provide many future passengers with a great holiday. Being one of the first guests onboard after she was officially named Royal Princess means that we were lucky enough to be one of the first to have the full Royal experience. She didn’t disappoint and overall did meet my high expectations. Having the chance to experience this ship in person has only fuelled my excitement for the launch of P&O’s, as yet unnamed, new ship in March 2015. Although evidence is suggesting that she won’t be an exact carbon copy, which in my opinion is good. If P&O can learn from some of the flaws present on Royal Princess, build on the tradition of British cruising and tastes, creating a ship as stunning as this designed for the British market, then we should be in for a real treat. 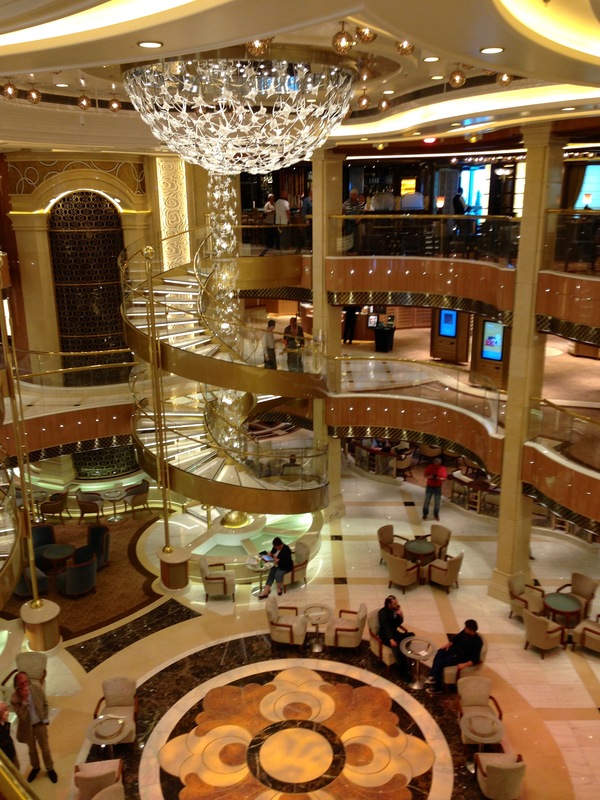 For me, the Royal Princess really did have the wow factor, similar to that which I had when I went on my very first cruise on the Independence of the Seas. Despite being much bigger than her predecessors, she felt very intimate with a great atmosphere. It goes to show that even after being lucky enough to have cruised several times, it is still possible to be wowed!